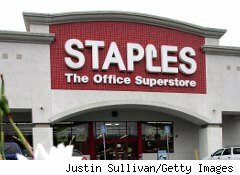 Use this Staples coupon to get 10% off any one item through Dec. 24, 2010. Valid in stores only. One per customer. Caveats: Not valid on desktop or laptop computers, tablets, netbooks, HP ink and toner, custom printing orders placed online, services, promotional products, Beats Audio, Amazon Kindle products, phone cards, stamps, gift cards, cell phones, cell phone services or previous purchases. One coupon per item.